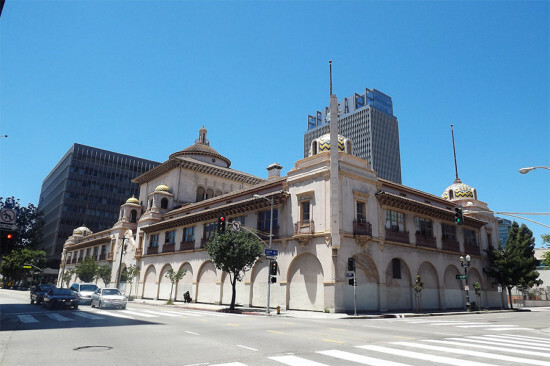 Search results for "frederick fisher"
Four teams have been shortlisted to compete for the design of the Armenian American Museum in Glendale, California. Commemorating the contributions of Armenian-Americans and "sharing the Armenian experience," the 30,000-square-foot building will include exhibition space, an auditorium, library, classrooms, and support spaces. The announcement came on the 100th Anniversary of the Armenian Genocide. The teams, chosen by the Armenian Genocide Centennial Committee (AGCC) of the Western US, include Yazdani Studio of Cannon Design, Belzberg Architects, Frederick Fisher and Partners, and Alajajian-Marcoosi Architects. The museum is in negotiations with the city of Glendale to secure a 1.7 acre property for the institution just south of the Glendale Civic Auditorium, at 1305 North Verdugo Rd. Lord Cultural Resources (who consulted on the 9/11 Memorial Museum) are helping develop the master plan for the museum site. Conceptual plans are due in mid-May, and the winning team will be chosen this June, said Berdj Karapetian, chairman of the AGCC's Landmark Sub-Committee. Karapetian said that after a feasibility study is completed the museum will begin raising money for the building, which he estimates could cost roughly $30 million to construct. The client wanted the building to have a strong presence. 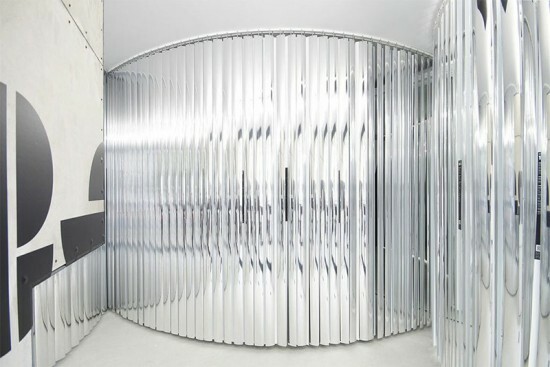 The architects achieved that by wrapping the exposed corner with looped ribbons of white lacquered steel. Patrick Tighe Architecture teamed with John V. Mutlow Architecture to design La Brea Affordable Housing—a newly completed sequel to the Sierra Bonita Apartments, which Tighe built four years ago for the same client, the West Hollywood Community Housing Corporation (WHCHC). The first was a pilot project for the City of West Hollywood’s Green Building Ordinance, and it launched a plan to upgrade and densify the scruffy east end of a city whose west side, bordering on Beverly Hills, is choking on its success. 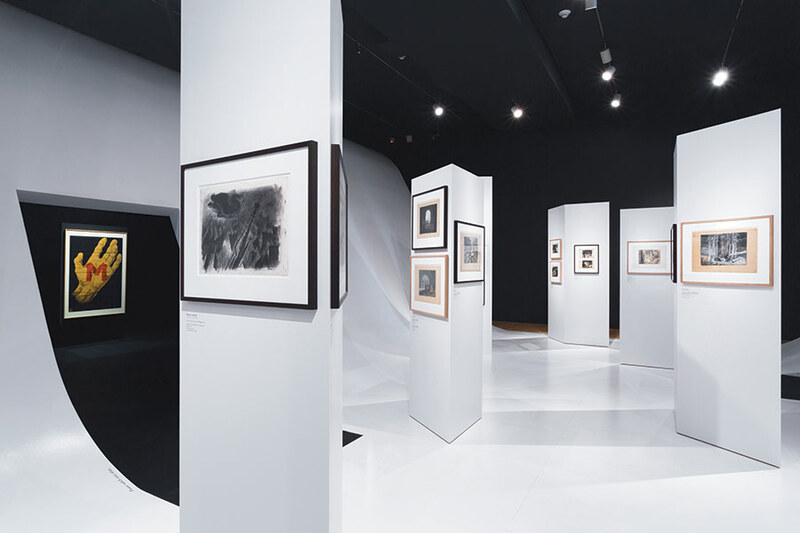 Tighe made his reputation with a succession of dramatically skewed houses and studios that drew on his experience at Morphosis. Sierra Bonita was his first affordable housing project, and he and Mutlow have applied the lessons they’ve learned on past jobs to this latest effort. It’s a five-story block with 32 wood-frame studios and one-bedroom apartments sitting atop a concrete and glass podium. Located a mile south of Hollywood Boulevard, the new facility provides a humane refuge for homeless LGBT youth and people living with HIV. More than a hundred such blocks are needed to meet the current demand: there were about 3,500 applications for these few accommodations. 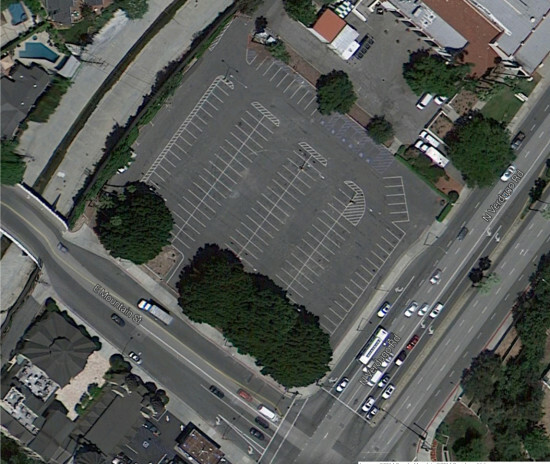 At street level, there is parking and a narrow garden for residents to the rear, and a storefront office for the non-profit AIDS Project Los Angeles. 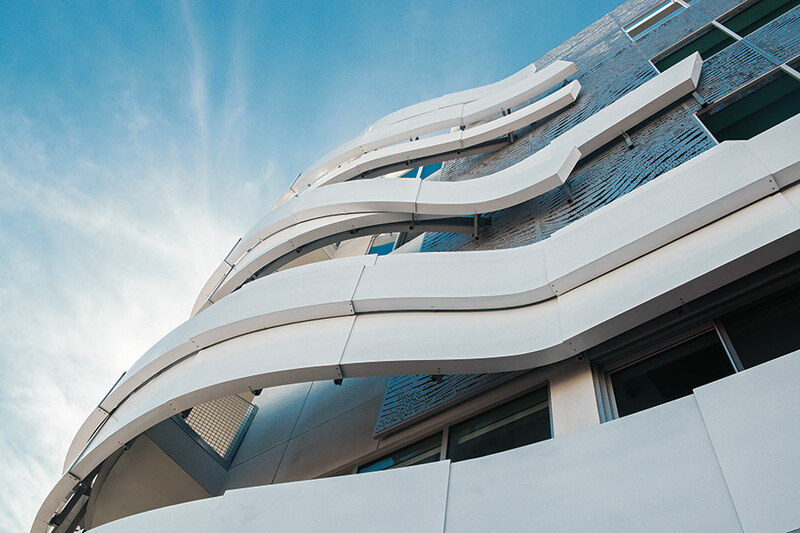 The client wanted the building to have a strong street presence, and the architects have achieved that by wrapping the building’s exposed corner with looped ribbons of white lacquered steel. Assembled from short sections of flanged plate, they enclose the lobby, give the block a distinctive signature, and mask wire-mesh balustrades. 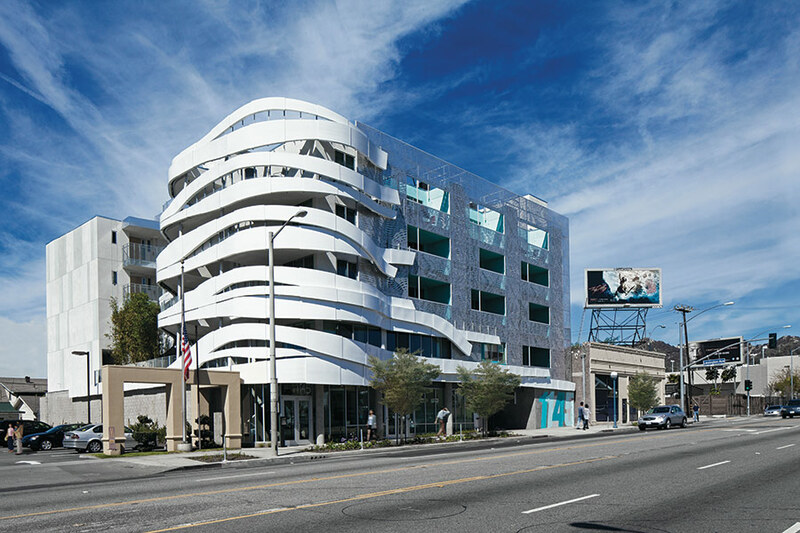 Their sweeping curves mediate between the rectilinear storefront and the fretted aluminum plates that clad the upper stories along La Brea Boulevard. Comprising ten custom patterns cut with water jets and randomly arranged, they also serve as a decorative sunscreen that frames inset balconies. The balcony reveals are painted aqua, in tones that lighten as they ascend. 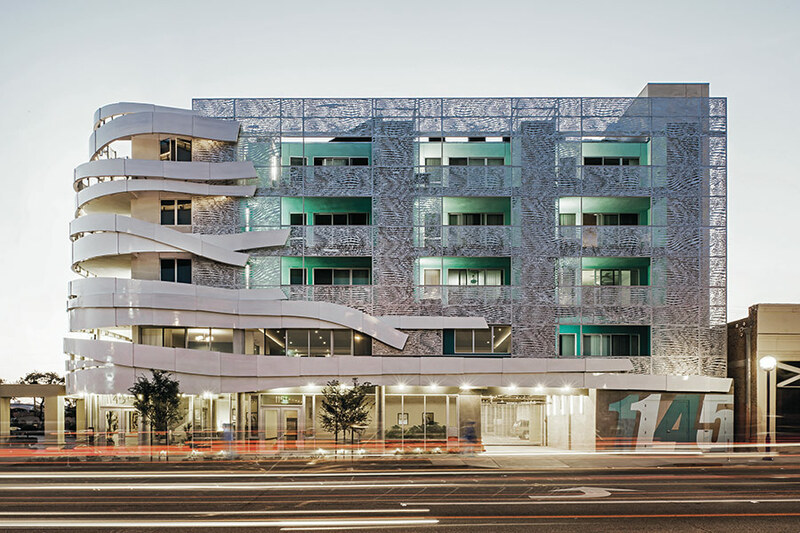 The facades demonstrate the architects’ skill in exploiting a budget of $160/square foot, employing durable materials and imaginative design to better effect than most market-rate apartment blocks. The interior is even more imaginative. 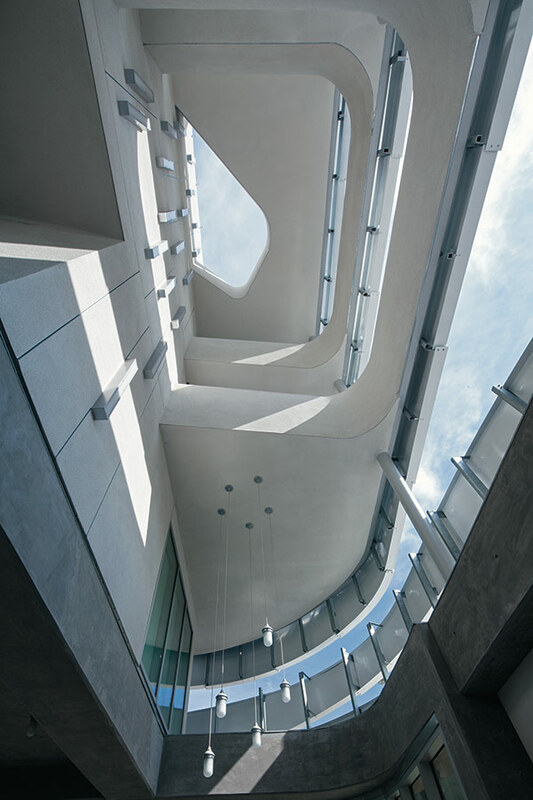 The corner lobby soars five stories to the roof and the openings between the steel ribbons pull in light, cooling breezes, and glimpses of sky. When it rains, the furnishings can be sheltered and water drains from the concrete floor. At the upper levels, apartments open onto a densely landscaped courtyard, which is oriented north-south and gives every apartment natural light and cross ventilation. It provides a sheltered gathering place in winter, and a cool, shady retreat in summer. Bamboo plants rise to the height of the building from sinuous concrete planters, which incorporate benches. A communal room, warmed by millwork and armchairs of reclaimed wood, opens off the second level, beside a laundry and social services. Solar panels, a gray water system, and a white vinyl roof membrane combine with passive strategies to achieve a high level of sustainability. To reduce costs, the living units are stacked, but each has a full bathroom and kitchen, plus storage and an 80 square-foot outdoor space. The WHCHC is funded from different sources, and each lender has a different set of requirements for access, materials, and open space, challenging the architects to reconcile conflicting demands. Large cities, from LA and San Francisco to New York, are notoriously over-regulated and that constraint, combined with a shortage of Federal and State funding, slows construction of affordable housing to a trickle. 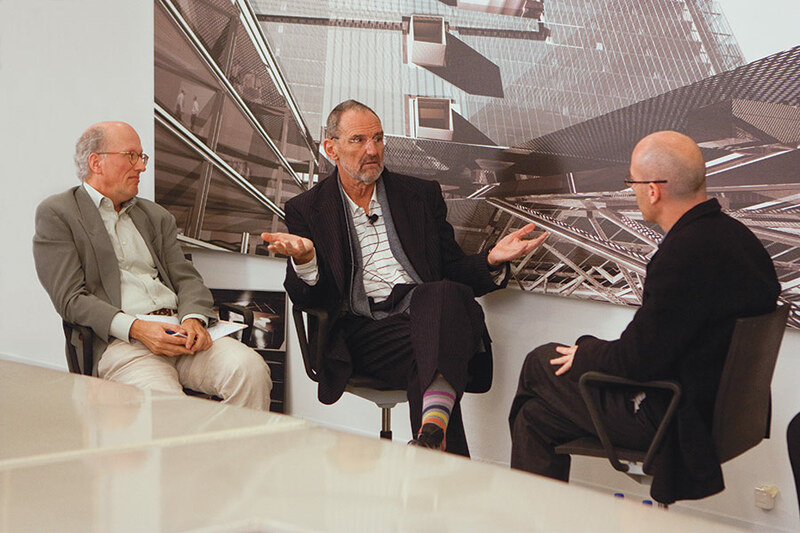 Many architects, from Rob Quigley in San Diego, to David Baker in San Francisco are eager to contribute more. In LA, Tighe and Mutlow join Michael Maltzan, Koning Eizenberg, Kevin Daly, Frederick Fisher, and others in reaching out to the needy only to find themselves frustrated by inflexible rules and a dearth of funding. Frederick Fisher and Partners' winning scheme. 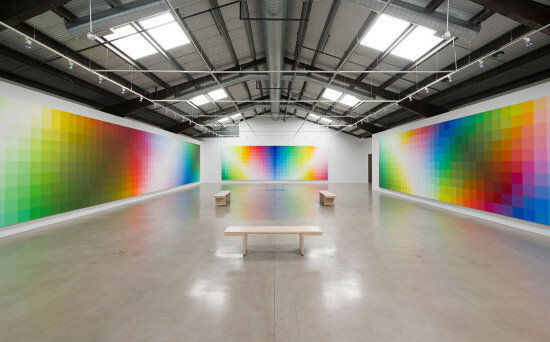 Since the mid-2000’s Santa Monica’s Bergamot Station Arts Center has been a lightning rod for debate about what the future of the city looks like and who decides. 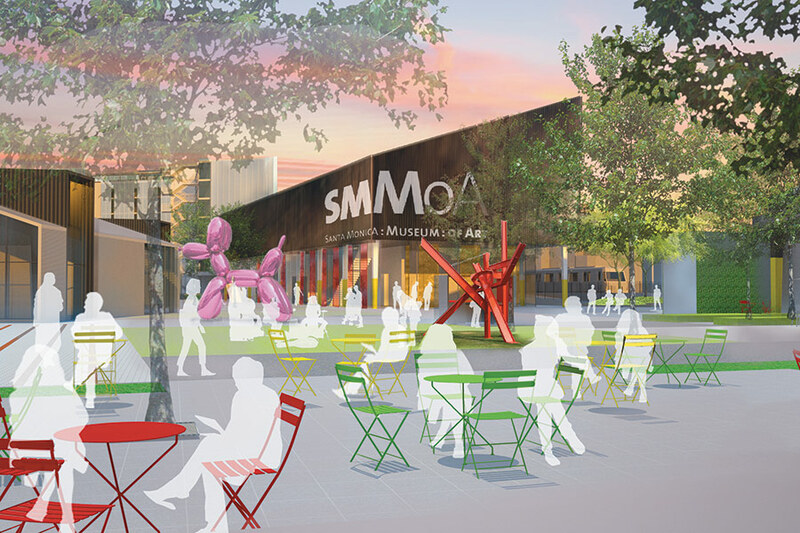 With post-recession rents skyrocketing and the impending arrival of the Expo light rail line in 2016, the city, which owns most of the land on which the center’s galleries sit, has been eager to redevelop the creative zone, which includes the hangar that is home to the Santa Monica Museum of Art. 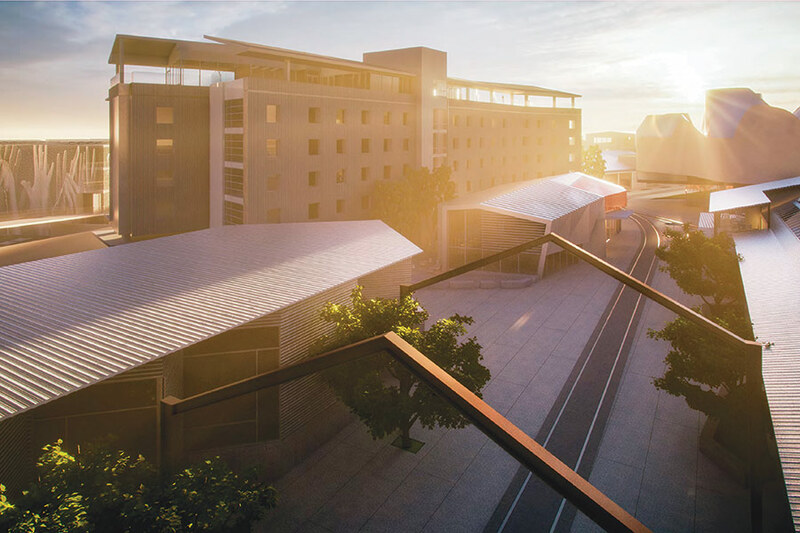 The project’s official RFQ, released in 2012, asked for designs that would “protect and enhance the area’s arts and creative uses” while bringing a greater mix to serve the anticipated influx of over 3,000 light rail riders per day. 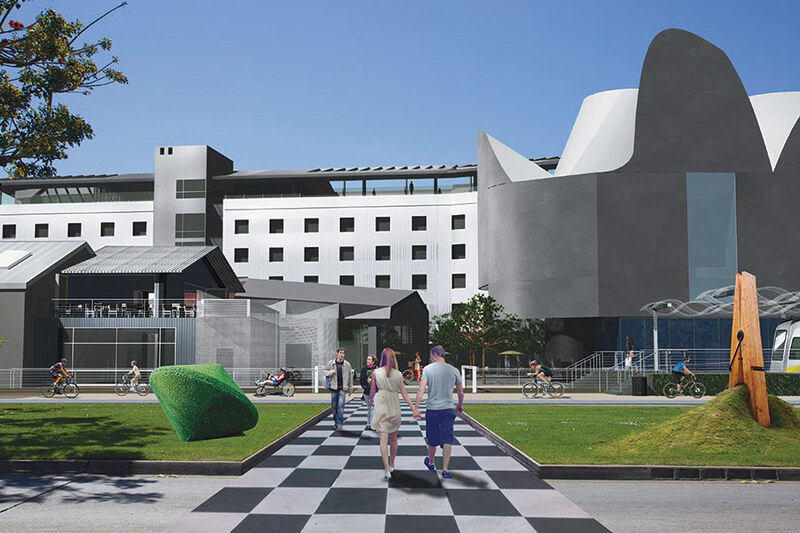 On September 9, after five hours of deliberation and more than one hundred speakers, the Santa Monica City Council selected a redevelopment scheme by Frederick Fisher and Partners. Fisher was the architect for the original Bergamot Station & Galleries project in 1994 after American Appliance had decamped from the sprawling industrial complex. Fisher’s proposal begins with the Station’s original DNA, retaining the industrial shed vernacular for most of the new buildings. The new museum, for example, is a playful interpretation of the pre-fab shed typology, lifted up and placed on a glass box for its entry lobby. The designs show a restraint that respects the scale of the original, making liberal use of corrugated metal and perforated metal screens. There is also a strong emphasis on public space and view corridors, linking building circulation that was pulled to the exterior with landscaped courtyards. 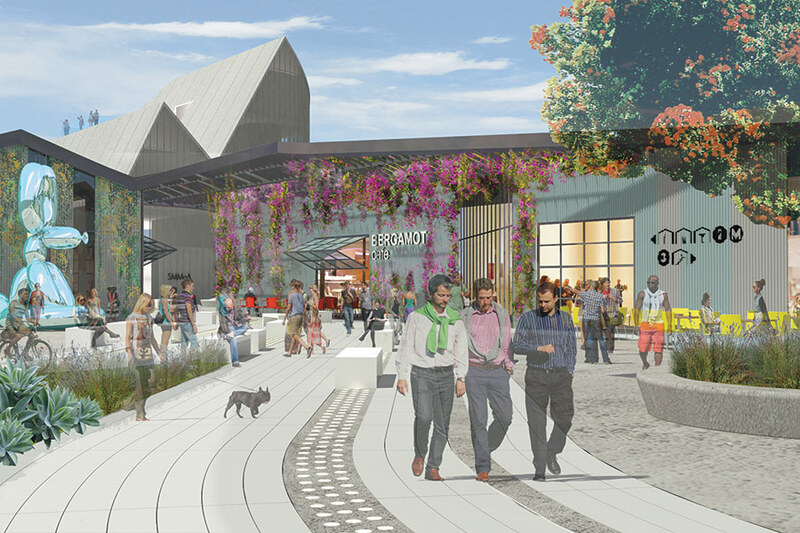 Bergamot is seen as a gateway, making connections to the new Expo light rail stop and the surrounding community while holding onto its character as an eclectic enclave. Under the developer umbrella of Bergamot Station Ltd/Worthe Real Estate, Fisher’s design team includes the landscape architecture firm Office of James Burnett, Community Arts Resources, which is known for art-centered planning, and SBE Hotel Group. Rios Clementi Hale’s finalist scheme. Two other development teams had been vying for the opportunity to transform Bergamot: 26Street TOD Partners/The Lionstone Group with Rios Clementi Hale Studios and Rethink/KOR Group with Michael Maltzen Architecture and David Hertz Architects. Rios Clementi Hale’s approach utilized a Butler building system, so new buildings would maintain a low-slung profile and complement the local vernacular. They proposed to reuse elements from dismantled buildings in the new construction, all tied together by a monolithic, industrial-style folding roof. For the Rethink/KOR Group proposal, David Hertz and Michael Maltzan formed a “design collaborative”, which also included Hornberger + Worstell, Katherine Spitz Associates for landscape, and John Bela’s Rebar Group known for “user-generated urbanism.” Their concept kept all the original buildings—modifying only one—and enhanced the campus-nature of the area with new landscape elements and amenities. Despite the choice of Fisher, who is known for his sensitive reuse work, some surrounding residents and gallery owners are not so convinced. They see the overall plans for Bergamot Station as a way to drive out creative uses and build another Watergarden, a self-contained office complex locals cite as something they do not want again. 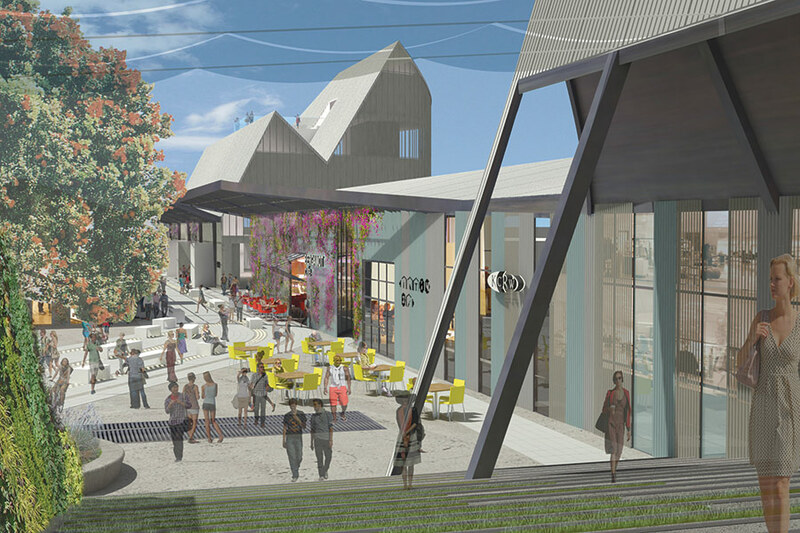 In May, a citizen-launched referendum spurred city council to reject the mixed-use Hines/Gensler Bergamot Transit Village, just north of the Bergamot Arts Center area. 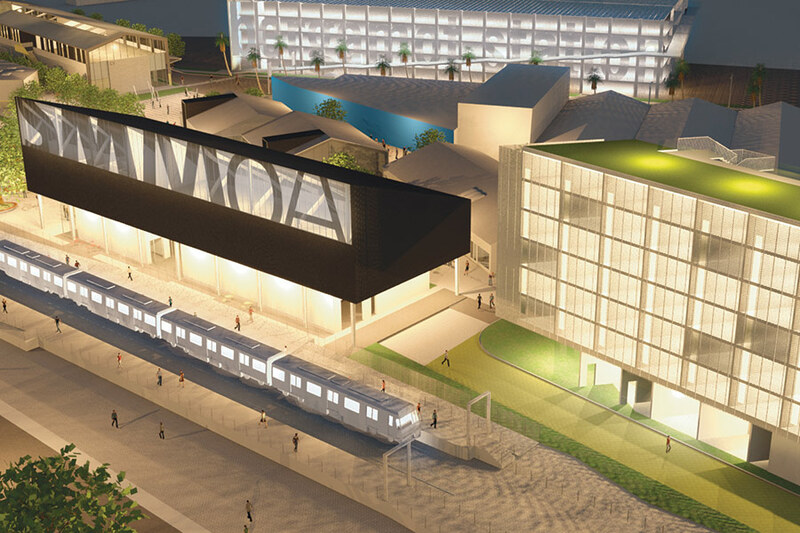 But with the arts district’s smaller, less-dense scope, things might be looking brighter for Bergamot Station. 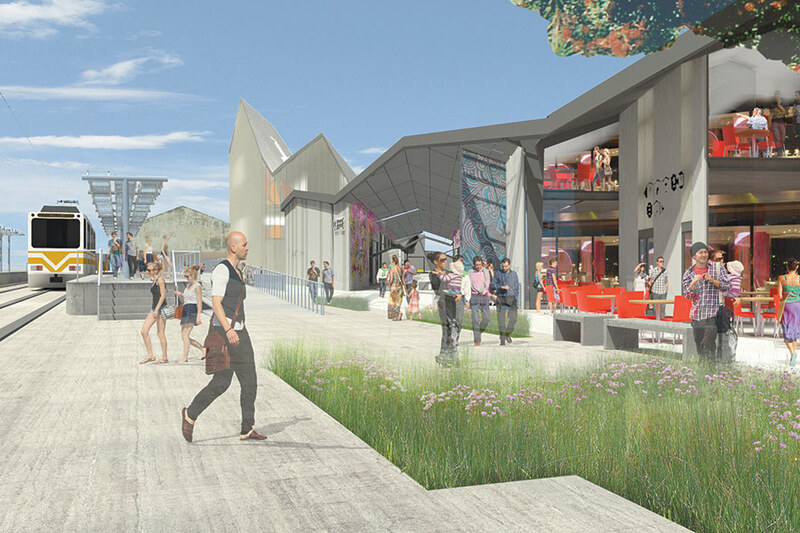 All the competing teams put forth visions that seemed to reinforce the unique village-like character of the place while adding architectural adventurousness that connects with the arts crowd. 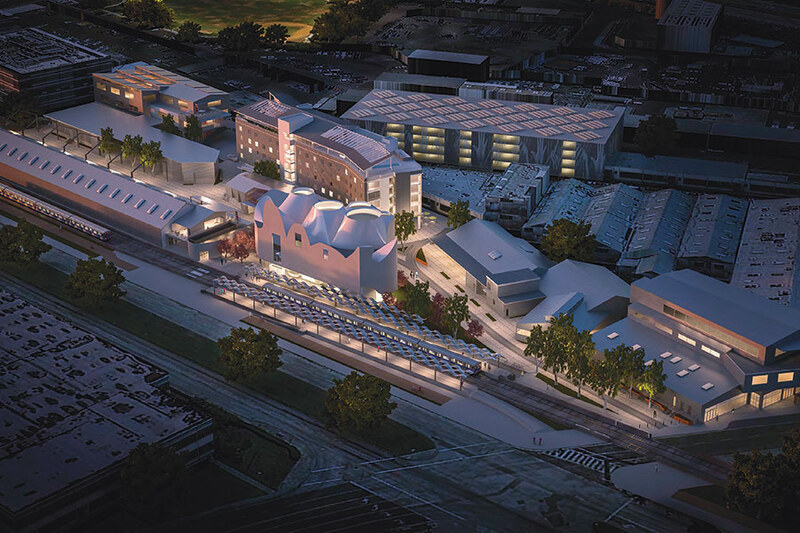 “We know that Bergamot Station is a unique project for Santa Monica and that the ultimate shape for it will come from collaboration and engagement with all stakeholders. We embrace this,” said Fisher. Cal Poly professor Stephen Phillips interviewed nine of the ten Los Angeles architects featured in the new book L.A. [Ten]. Frank Gehry, the most notable of this loosely linked pack that came to prominence in the 1970s and 80s, is absent. The majority of these mavericks were featured in A Confederacy of Heretics, the exhibition that SCI-Arc presented last year. As with the New York Five, and other ad hoc groupings, each went in a different direction. 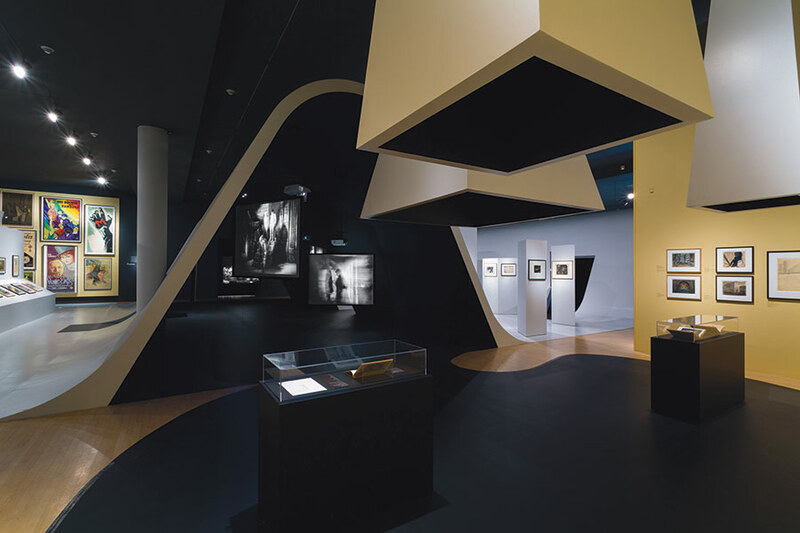 As Phillips observes in his introduction, “The group as a whole seemed less important to them than their own individuality… LA was a place of free expression.” The label originated with a series of lectures and exhibits, inspired by the European Team X, which Thom Mayne organized in his Venice home-studio in 1979. Pictures of each of the architects in the L.A. Ten. These interviews, a group endeavor by the Cal Poly LA Metro Project and the Getty Research Institute, constitute an oral history of a turbulent and creative era. Even Mayne, whose career has burgeoned in the past three decades, looks back on that time with wistful nostalgia. He recalls the genesis of SCI-Arc as a throwaway remark by Ray Kappe, who gathered the dissident faculty of Cal Poly Pomona and said “Let’s start a school.” Forty senior students signed up for a penniless institution operating out of an empty warehouse; five faculty worked long hours without pay for the first two years. Against all the odds, SCI-Arc flourished, while keeping its edge. 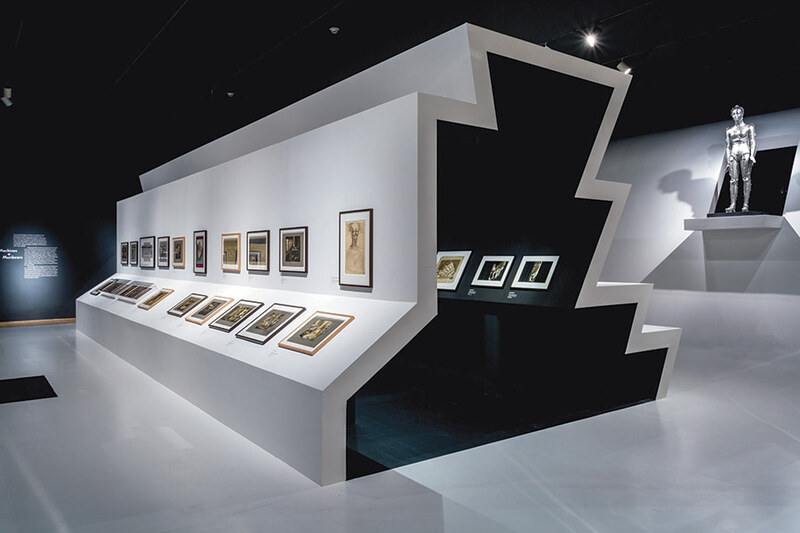 That provided a hub for experimentation that channeled and stimulated the talents of young architects who wanted to break away from the stale conventions of modernism. It helped that there was a confident mood in LA leading up to the 1984 Olympics, and the Los Angeles Times gave architecture critic John Dreyfuss a prominence unthinkable today. UCLA’s School of Architecture under Tim Vreeland was another incubator. Excitement was in the air, and it is fascinating to hear how these ten architects saw their contribution, then and now. The other architects—Neil Denari, Frederick Fisher, Craig Hodgetts, and Ming Fung, Wes Jones, and Coy Howard are more conversational, recalling their first encounters with LA and especially with Venice, which was then a cheap, seedy backwater, beloved by impecunious artists. It is the LA that is 98 percent mundane with a few scattered sparks of brilliance and eccentricity that nurtured Reyner Banham, the Eameses, and a long succession of architects who found opportunities here they would never have enjoyed in conventional cities. The perspective of the LA Ten is invaluable—as social history and as a spur for another tide of talent to ameliorate the mediocrity. As the economy continues to roll we’re again awash in shortlists and competition wins. The Santa Monica City Services Building has a shortlist that includes SOM and Frederick Fisher. Teams shortlisted for the Herald Examiner Building include Christof Jantzen and Brenda Levin. 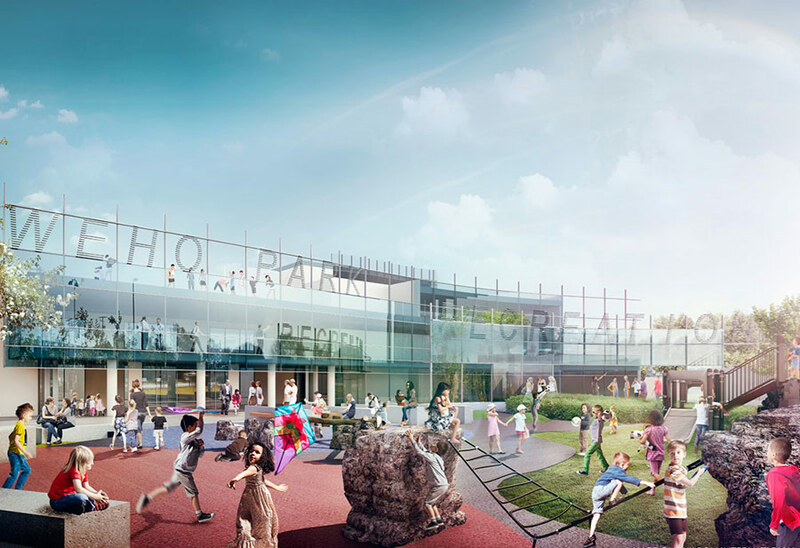 LA’s Wildwood School shortlist includes Gensler, Koning Eizenberg, and one unknown team. 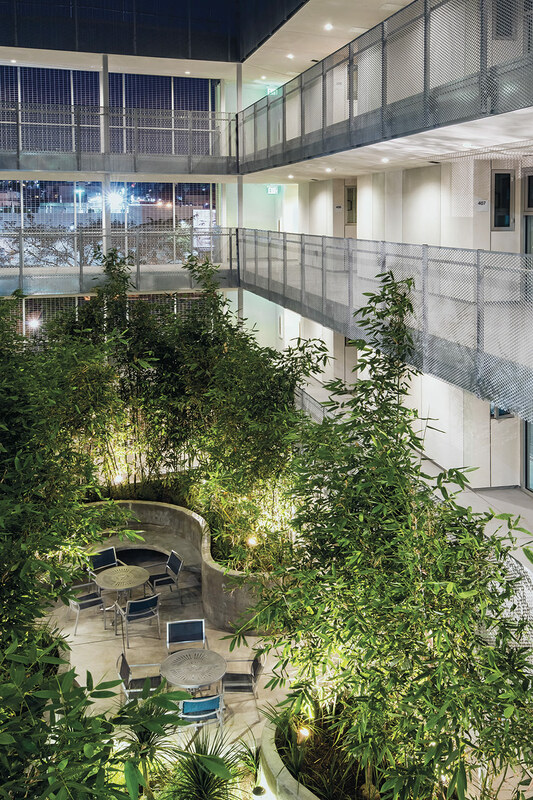 The UC San Diego Biological Building has gone to CO Architects (recent winners of the AIACC Firm of the Year award). EHDD has won the Long Beach Aquarium of the Pacific, and Harley Ellis Devereaux has won the Long Beach Belmont Plaza Pool. 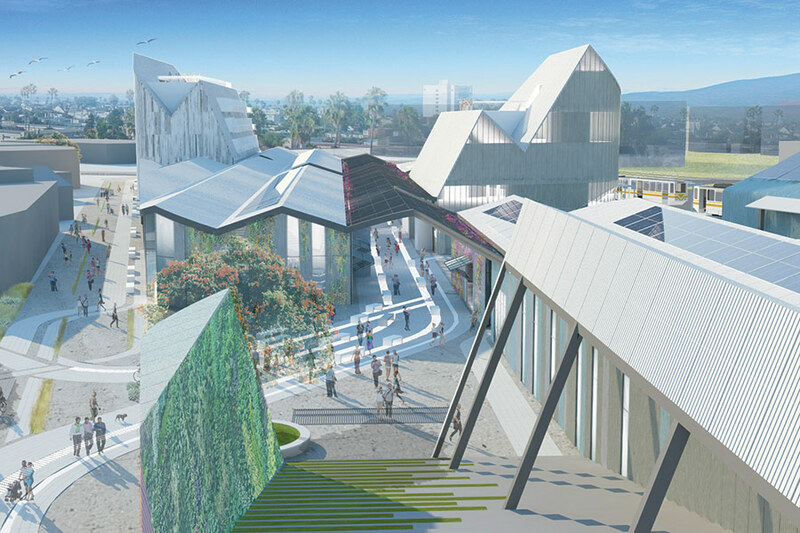 Last month we revealed three shortlisted schemes for the new West Hollywood Park, adjacent to the city's new library off La Cienega Boulevard. Last week the city announced that LPA and Rios Clementi Hale has won, beating out other finalists Frederick Fisher and Partners with CMG and Langdon Wilson. 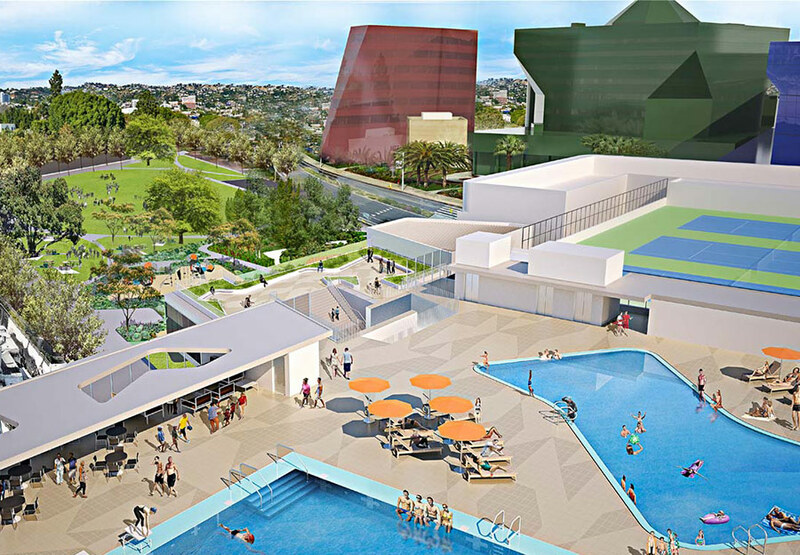 The scheme puts a strong emphasis on the connection between the park itself and its new recreation center and "resort style" rooftop pool (with cabanas and a view terrace). The rec center, clad with vertical green screens, will contain a park-like podium and a large grand stair leading from to the park. The sprawling public space would be divided into a hard-edged “public park,” programmed for larger events and athletics, and a sinuous “neighborhood park,” set for passive activities. The $80 million project is set for completion in 2017. Proposal by LPA with Rios Clementi Hale. The City of West Hollywood is preparing to get a lot greener. 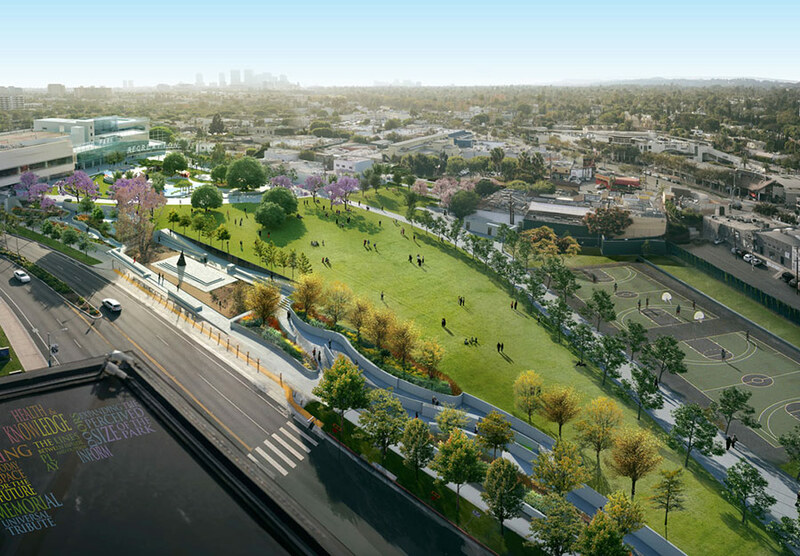 While still mired in lengthy delays related to its Plummer Park, further east, on Monday city officials unveiled the finalist schemes for the second phase of its new West Hollywood Park, located next to Johnson Favaro’s new public library and public spaces, just west of San Vicente Boulevard. Three shortlisted teams — Frederick Fisher and Partners with CMG, LPA with Rios Clementi Hale, and Langdon Wilson —unveiled conceptual master plan renderings. The ideas are still considered “conceptual,” because they could be scaled down due to practical concerns, explained city officials. 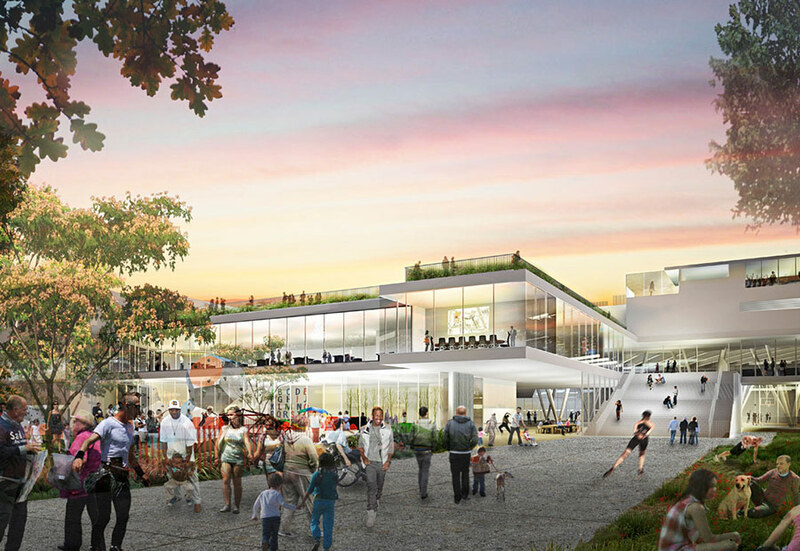 The $80 million project will remove several existing buildings from the site—including the Edward Fickett–designed Library, and the current auditorium, swimming pool, park office, and support buildings, to make room for an expanded core of grass and trees. 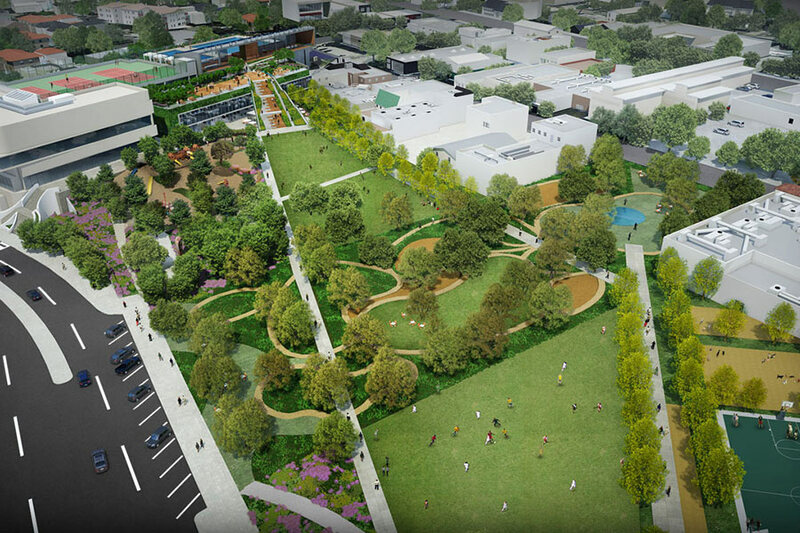 The park will now contain over five acres of uninterrupted open space. 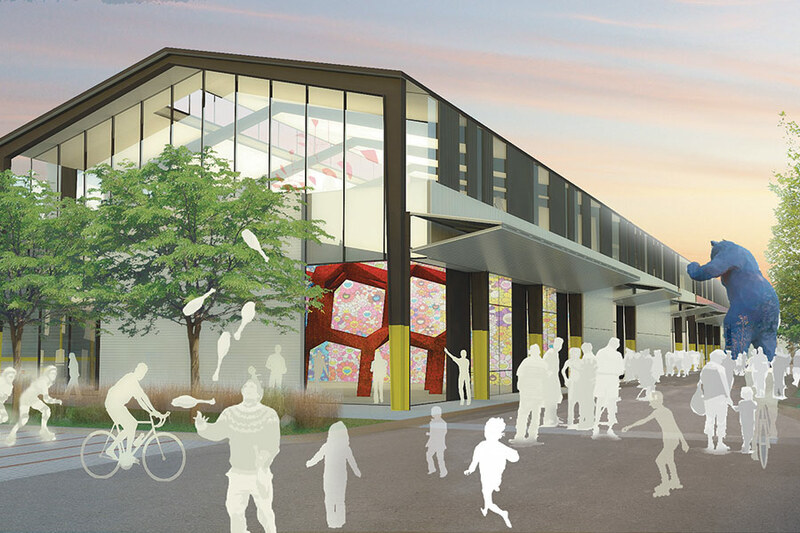 New buildings will be highlighted by a new 70,000 square foot recreation and community center with a rooftop pool, park support facilities, and children’s playground areas. 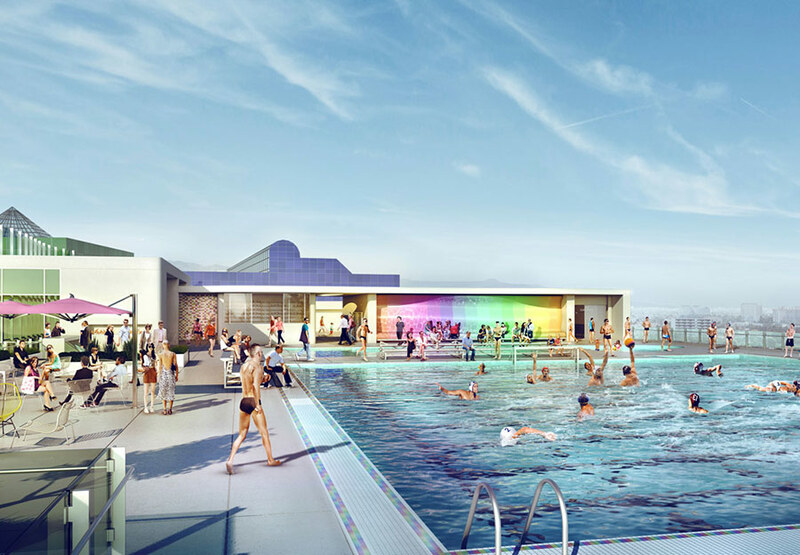 All of the proposals focused on the new recreation center and rooftop pool, and tried to encourage interaction between the new building and its adjacent park. The finalists were culled from an original field of 24 design teams, which was later narrowed down to nine. 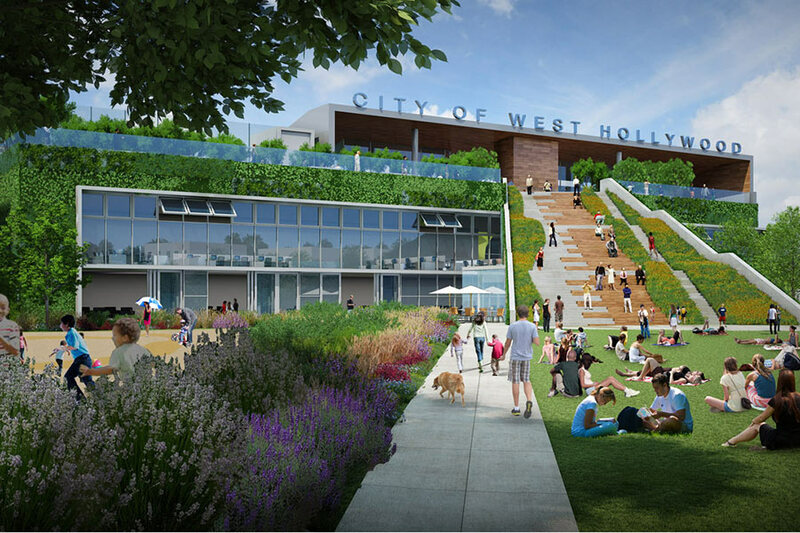 The Fisher team’s proposal includes a large grass-topped podium, and a stair, connecting the park to the rec center. “The building itself is an extension of the park,” said Fisher. Its fractured landscape, set with meandering pathways, would be divided into varied zones, including a reading garden, a sloped garden walk, garden “rooms,” and the “great lawn,” a large open grassy space. 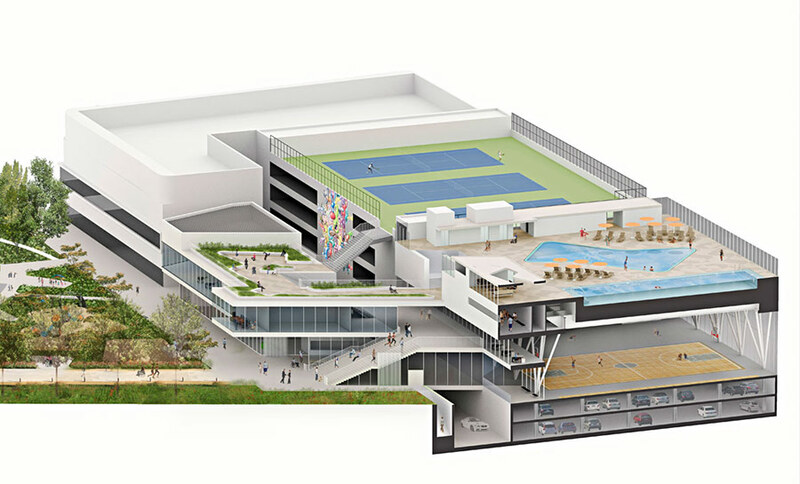 LPA’s proposal also fused the recreation center with landscape, with vertical green screens, a park-like podium, and a larger grand stair leading down from the pool to the park. Its rooftop pool would be “resort style,” with cabanas and a view terrace, and inside a two-story volume would contain a large rock-climbing wall. Its “public park,” programmed for larger events and athletics, would be set along much harder angles, overlaid with a sinuous “neighborhood park,” set for passive activities. “We feel the two parks in one gives West Hollywood the best of both worlds,” explained Rios Clementi Hale senior associate Samantha Harris. Proposal by Frederick Fisher and Partners with CMG. Langdon Wilson presented a slightly more traditional proposal, dividing architecture and landscape, with a layered building clad with a glass curtain wall. “The facility needs to reflect the park, but it’s about the park at the end of the day,” explained Langdon Wilson project architect Rick Sholl. The team’s garden would create an “outdoor living room,” made up of greensward, recreation, and an “outdoor living room,” combining structured with open areas. 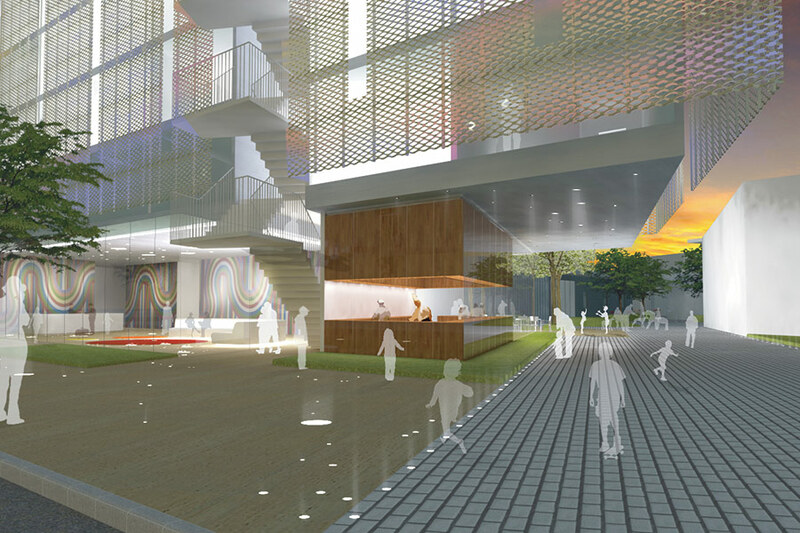 A “Rainbow Garden Walk” and amphitheater would link the upper level of the park with San Vicente. West Hollywood’s Huffer said that the winning scheme will be revealed at the city’s next council meeting, on January 21. Construction would likely be completed sometime in 2017, he noted. He added that he didn’t expect this problem to be beset with public outcry the way Plummer Park had. Olin’s plan for Plummer Park had come under fire from residents for, among other things, plans for new buildings, plans to demolish existing buildings and plans to remove mature trees. That project had been put in further jeopardy because of the dissolution of the state’s Redevelopment Agencies. The city has confirmed that Olin is no longer associated with that project. Unofficially the city is now having discussions with Brooks + Scarpa about the upcoming direction, said one city official. The architecture business seems to be—slowly—rounding back into form in Southern California. One indicator? A bunch of Requests for Proposals (RFPs) and Requests for Qualifications (RFQs) for major public projects. 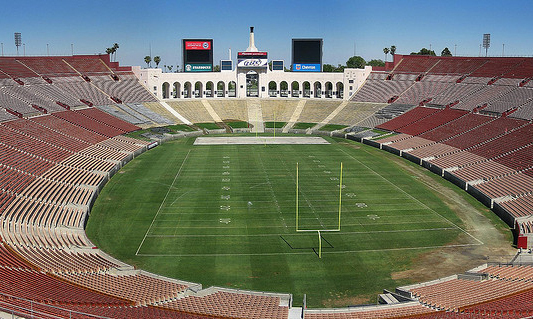 One of the most significant is the $70 million renovation of the Los Angeles Memorial Coliseum, whose management was taken over by the University of Southern California (USC) this summer. The iconic Parkinson & Parkinson–designed building will undergo long-delayed updates throughout, including improved sight lines, seating, concessions, audio/visual, lighting, restrooms, and much more. The stadium's last major upgrade came in 1993. The shortlist for the project for now includes Populous, NBBJ, DLR, HNTB, Gensler, and 360 Architecture. 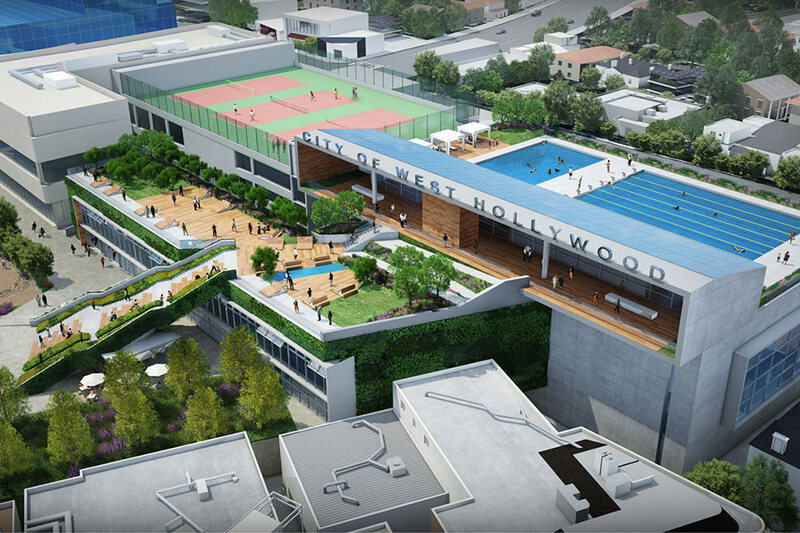 The West Hollywood Park Master Plan, to devise a new 70,000 square foot recreation center adjacent to Johnson Favaro's new West Hollywood Library, has a shortlist that includes recent AIA/LA Gold Medal winner Frederick Fisher and Partners with CMG and Buro Happold, Langdon Wilson, and a mystery team that we're still trying to ascertain. For the Long Beach Civic Center, which includes a commission for a new city hall, main library, and the revitalization of Lincoln Park, the shortlist includes architecture teams led by Fentress, SOM, and Pei Cobb Freed. Stay tuned as we learn the fates of all of these projects.